In each issue of Today’s Veterinary Practice, Pet Health by the Numbers correlates an article topic with statistics provided by Banfield Pet Hospital (banfield.com). 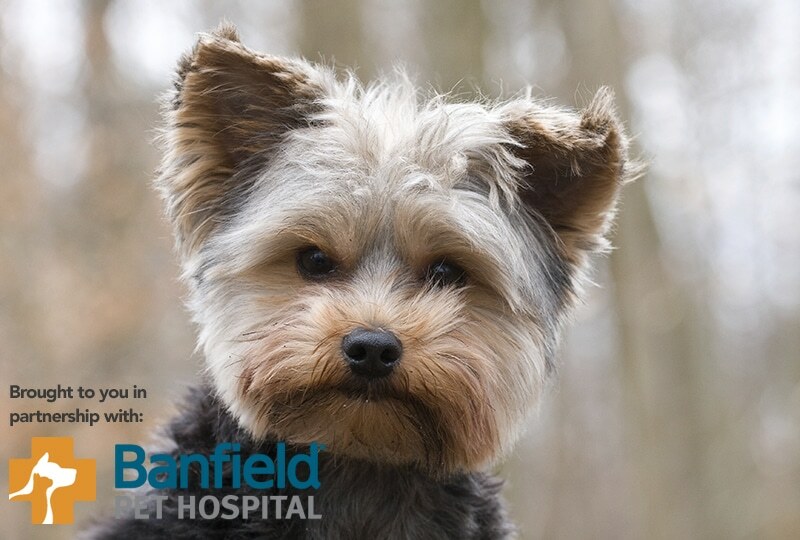 These statistics are extracted from data collected from the medical records of nearly 2.4 million dogs and more than 480,000 cats presented to more than 890 Banfield Pet Hospitals in 2014. Learn more about data collection by reading Welcome to Pet Health by the Numbers (January/February 2014 issue) and Key Findings from the State of Pet Health 2014 Report (May/June 2014 issue), both available at tvpjournal.com. 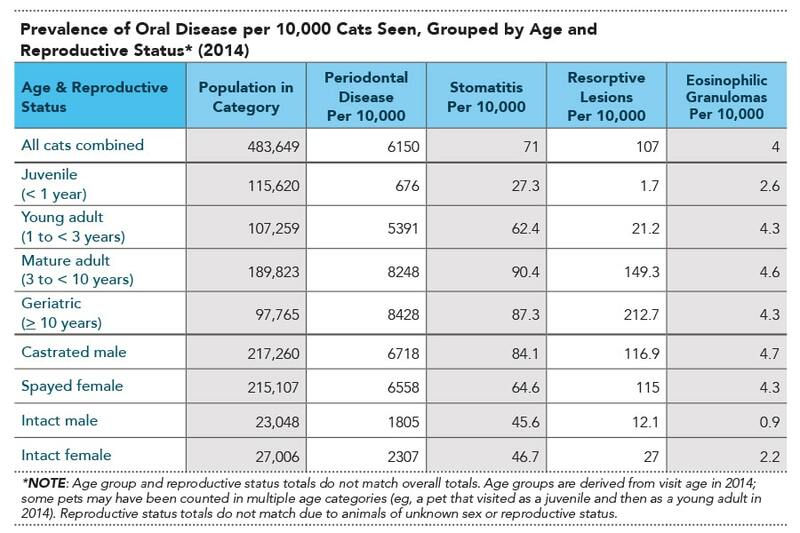 The following table outlines the prevalence of oral disease in cats presented to Banfield Pet Hospitals in 2014. External tooth resorption in cats is discussed in External Tooth Resorption in Cats—Part 1: Pathogenesis, Classification, & Diagnosis. 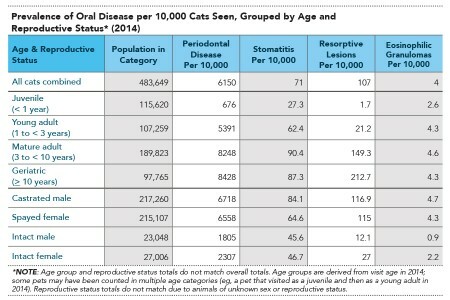 Path to Pet Wellness: I read with interest Banfield Pet Hospital’s reported prevalence of oral disease per 10,000 cats seen, grouped by age and reproductive status. The reported incidence of periodontal disease of over 80% in the mature and geriatric population correlates with generally accepted feline figures. Although I am not familiar with any published studies describing the incidence of stomatitis or eosinophilic granulomas in cats, the incidence of resorptive lesions reported here (in the range of 1%–2%) greatly underrepresents expectations, with the generally published incidence ranging between 30% to 70% of the mature cat population. I suspect the difference in numbers lies in the method of gathering information. Tooth resorption in the cat begins in the cementum just apical to the cementoenamel junction, which is generally hidden from the naked eye and easily missed in the examination room. To properly diagnose early tooth resorption, anesthetized tooth-by-tooth examination with a dental explorer and intraoral radiography are needed. I look forward to further peer-reviewed dental prevalence studies. The data in the table show that intact cats have substantially less periodontal disease than neutered cats. However, this is not due to the fact that neutering pets increases their risk for this disease but, rather, because intact cats, on average, are younger than neutered cats. As stated in the commentary, incidence of periodontal disease is much higher in mature and geriatric cats. Girard N, Servet E, Biourge V, Hennet P. Periodontal health status in a colony of 109 cats. J Vet Dent 2009; 26(3):147-155. Gorrel C. Tooth resorption in cats: Pathophysiology and treatment options. J Feline Med Surg 2015; 17(1):37-43. doi: 10.1177/1098612X14560098. Gorrel C, Larsson A. Feline odontoclastic resorptive lesions: Unveiling the early lesion. J Small Anim Pract 2002; 43(11):422-428. Lommer MJ, Verstraete FJM. Prevalence of odontoclastic resorption lesions and periapical radiographic lucencies in cats: 265 cases (1995-1998). JAVMA 2000; 217(12):1866-1869. O’Neill DG, Church DB, McGreevy PD, et al. Prevalence of disorders recorded in cats attending primary-care veterinary practices in England. Vet J 2014; 202(2):286-291. doi: 10.1016/j.tvjl.2014.08.004. [Epub 2014 Aug 7]. Ohba S, Kuwabara M, Kamata H, et al. Scanning electron microscopy of root resorption of feline teeth. J Vet Med Sci 2004; 66(12):1579-1581. Pettersson A, Mannerfelt T. Prevalence of dental resorptive lesions in Swedish cats. J Vet Dent 2003; 20(3):140-142. White SD, Rosychuck RAW, Janik TA, et al. Plasma cell stomatitis-pharyngitis in cats: 40 cases (1973-1991). JAVMA 1992; 200:1377-1380.